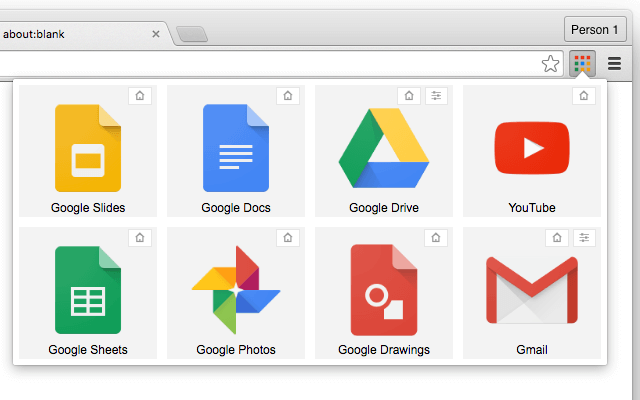 "Chrome Apps Launcher" is a Chrome extension to fill the gap of Chrome removing the built-in apps manager. This extension provides a customizable panel to view and launch all your installed applications in one place. What is "Chrome Apps Launcher" extension and how does it work? Chrome Apps Launcher extension aims to fill the gap of not having a built-in application launcher in Chrome. Chrome team has decided to discontinue the built-in app launcher shipped with Chrome. This extension provides the same functionality. You can see all your apps in a single place. Open home pages or settings right from the panel, or just run the app. For your convenience, it is also possible to change apps order to have better management. Is it possible to open the default app-launcher from the toolbar panel? Yes, simply right click the toolbar button to see a list of most useful "chrome://" pages. How can I change the order of shown apps? There are two ways to change the order. Once right click the panel and open the default app launcher in a browser tab and re-order the apps from there. Chrome Apps Launcher extension respects this order. However, you can still overwrite this order from the panel itself. Just hold your mouse pointer over an app and change its position. New positioning orders are stored and will be used to overwrite the default one. In Chrome app launcher is it possible to add shortcuts to some Goolge products? Yes, almost all Chrome products have their own application shortcut in the Store. Just search for the product you are interested in and install the shortcut app (this is not a real app, just a bookmark like link to the actual web app). Once the app is installed and is observed in the default app launcher, it will also can be accessible from the panel view as well. What is the list of supported services in the right click menu over the toolbar button?